Traditional Turkish marriages were once arranged by the parents of the couple. While this practice is still in effect in parts of Eastern Turkey, a majority of Turks choose life partners of their own accord. Once a partner is chosen, however, the path toward marriage is typically paved by the traditions that encompass the blessing and participation of their close-knit extended families. Once a couple has chosen to marry, the next step is to meet each others' parents. Without the approval of their parents, it is unlikely that the couple would proceed to marriage, regardless of the depth of their love for each other. Thus, though these initial steps toward marriage are rituals based on tradition, they do carry a lot of weight in the culture still. The first step is to meet each others' parents. These are formal affairs, where everyone dresses in their best and hosting family members take time away from their daily routines to prepare a special meal for their guest of honor. After dinner is eaten together, traditional sweets, tea, and fruit are served and a conversation commences. If the families approve, then a date is set for both families to meet each other to continue the progression. None of these are casual affairs, such as we would arrange in America. Rather, they are all formal events laced with tradition. According to said tradition, when it's time for the families to meet, they converge at the home of the bride-to-be's parents. When the day arrives, her family prepares the food and helps her get ready. It is typical for the woman to visit a salon for hair and makeup. These meetings are considered a formal cause for celebration, so everyone dresses up and often important members of their extended families are invited, as well. The man's family will arrive at the door with a box of chocolates and a bouquet of flowers in hand. This signifies a request to eat sweet and then talk sweet, and expresses clearly their intent to ask for her hand in marriage for their son. While some families actually declare their intent by asking outright, others allow the sweets and flowers to do the talking for them. Both ways are acceptable. Once the guests have been properly greeted and the small talk is well under way, the bride-to-be commences with the first of the evening's traditions: making Turkish coffee. A perfect cup of Turkish java has bubbles on top, and this test of her skill is the one his parents will claim to use to determine her potential as a good wife. Not to worry, inherent in this custom is a test of the groom-to-be's character, as well. The bride-to-be is encouraged to put salt in his coffee. If he is able to drink it without showing his displeasure, he will have demonstrated to her parents that he is able to show patience in the difficult days they will face in their future. As with most customs like these, this is an opportunity for the families to have fun together and not a true test of their character. Humor aside, the next portion of the evening is a solemn affair, conducted by the oldest member of the groom-to-be's family. He speaks to her family on behalf of the man, announcing his intention to request permission to marry their daughter/granddaughter. An elder of the bride-to-be's family replies with their assent (hopefully), and then the couple take turns kissing the backs of their elders' hands. As a symbol of sweet harmony between the families, sherbet is poured and everyone drinks to the arrangement. Once the families drink the sherbet together, they choose an auspicious date for the engagement party. In cases where the families have known each other for a long time, or when the couple wishes to wed quickly, this event can be combined with the initial meeting of the families. Traditionally, however, the engagement party is a separate event, another opportunity to fix a fancy meal, get all dressed up, and celebrate the good life. Between the meeting of the families and the engagement party, the groom-to-be's mother will take her future daughter-in-law shopping for a new dress, fancy shoes, and engagement bands. 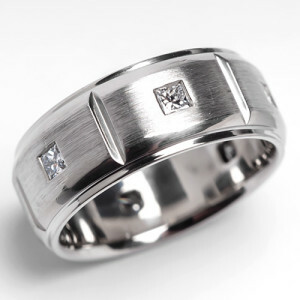 These bands are typically gold, though they can be silver or platinum, as well, and they can run the gamut of styles, from simple plain bands to ornately engraved bands. At another time, the mother of the groom-to-be also sets out to purchase a very special gift for her future daughter, which she will present to her at the party. On their chosen date, invitations are sent to close family and friends, and once again the families converge at the bride-to-be's parents' home. Lunch is served, with the women and men typically segregated, and afterward the customary rituals begin. First the mother of the groom-to-be presents her future daughter-in-law with the gift she purchased ahead of time: a lovely parure, including a necklace, a bracelet, and a pair of earrings. At this time, other distinguished members of both families are free to present the bride with gifts as well, usually more jewelry. Shortly thereafter, the engagement rings, tied together by a red ribbon, are brought out by the bride-to-be and an appointed family representative on a special presentation tray. This representative (typically an elder aunt or grandparent of one of the families) offers a word of intent and blessing and then places the rings on the bride and groom's right ring fingers. In some families the couple will spend the rest of the evening joined by their rings and the red ribbon, but in others the rings are cut by the family representative with a specially decorated pair of scissors. Afterwards, the youngest members of the families bring out the engagement cakes, and the families continue with harmonious conversation. In some households, it is customary for the youngest members of the families to join the newly engaged couple for a night out on the town, thus ending the party. This engagement period is slightly different from ours in the States, as Turkish culture allows that the couple may or may not proceed to the altar from here. Even though expensive gifts are given, and even though rings are exchanged, the engagement period is one in which the families are expected to test their mutual good will. Much depends on this harmony between the families, and so there is a bit less pressure on the couple. The possibility of marriage is wide open and hoped for, but the arrangement is not actually as binding in Turkey at this point as it seems to be in America. As the months progress toward the wedding celebrations, the couple's families begin to lavish them with gifts in preparation for their new life together. Furniture and household goods are provided for the couple, so that when the wedding comes there is no need for the guests to bring gifts of tea towels, punch bowls, china, and mixing bowls. Instead, they rain upon her with money. Forget the money tree, the Turkish bride becomes the fount of all blessing as she is literally showered with bills and coins and gold. And this is after the henna night and an exchange of yet another set of rings, these worn on the left ring finger, and a series of parties and festivals that can last for weeks on end. What a rich and glorious tradition, yes?! ?